Last week in New Zealand, the Productivity Commission released a Housing Affordability Report. The report included a review of a housing, insulation and health study involving 1,400 households from seven regions. It showed dramatic health improvements brought about by interventions such as replacing inefficient electric heaters and unflued gas heaters with heat pumps, wood pellet burners and flued gas heaters. These positive effects were more marked for low-income families. In New Zealand, excess moisture is a major problem leading to mold and ill-health effects and the dry heat produced by pellet stoves was an excellent remedy. One of New Zealand's leading researchers on inequality in health and housing, Philippa Howden-Chapman, pointed out that the lowest income families spend about 13 percent of their income on heating, while the wealthiest only about 2 percent. Around 1600 extra people die in winter than in summer due to poor housing and a lack of heating. Lack of affordable housing and heating is not a new phenomenon. Two thousand years ago a pregnant woman and her carpenter husband could not find adequate or affordable lodging, and the woman had to give birth in a manger. Ever wondered how many of the approximately 10 million wood stoves in the field today are clean-burning? According to a new article written by James E. Houck and published in Hearth & Home magazine, 35% of free-standing cord wood and pellet stoves are EPA-certified. The estimate is based on manufacturing records supplied by HPBA and the American Housing Survey, and does not include fireplace inserts. Finding accurate data on certified vs. uncertified stoves was no easy task, Houck writes, because many home occupants don’t know the status of their heaters. To make matters worse, many states in the South and Mid-Atlantic region have few regulations or programs to encourage the purchase of new lower-emitting wood stoves. Oregon remains the only state that requires uncertified stoves to be removed when a home is a sold. It seems much more must be done before the reality of wood heat catches up to the precedent set by the New Source Performance Standard, passed over two decades ago. Deciding which woodstove to buy can be tough, even if you've been heating with wood for years and are simply looking for a replacement stove. John Gulland, writing for Mother Earth News, brings a fresh, important and independent perspective to the subject. (The editors even made him name certain manufacturers.) He stresses focusing on a good hearth store first, where you can get good advice and service, and then focus on a brand. Many consumers buy based on aesthetics, but first look at how long company has been in business, Gulland says. For the first time, wood and pellets are included in the annual Winter Fuels Outlook produced by the Congressional Research Service (CRS). The Alliance worked with CRS, the offices of Senator Shaheen and Congressman Van Hollen and others to ensure that wood and pellets are recognized as an important winter fuel. The CRS report summarizes a more detailed report from the Energy Information Agency, which has still not included wood and pellets. Senators Snowe, Bingaman and Feinstein introduced the "Cut Energy Bills at Home Act" which would give up to a $5,000 tax credit for performance-based home improvements. The bill, as written, makes biomass heaters eligible if savings can be calculated with approved energy efficiency software packages, such as RESNET, BPI or an alternative software. The Alliance for Green Heat is working with Congressional offices and efficiency standards organizations to ensure that there will not be unforseen barriers for biomass heaters. Currently, most energy efficiency software does not have sufficient ability to analyze performance and savings of biomass heaters. Support Your Economy, Buy Local Firewood! From retail shops to farmer’s markets, stickers and posters with the slogan “Buy Local” can be seen plastered just about everywhere these days. They're there to remind shoppers that purchasing goods and services locally supports small community businesses, protects the environment and keeps the local flavor of an area alive. Based on the disproportionate amount of coverage it receives, you might think that purchasing locally only applies to food. And while it may be the case that locally grown fruits and vegetables are often fresher and more wholesome – not to mention more sustainably harvested – than what is sold in the chain supermarkets, food is certainly not the only product you should be buying locally: wood stove owners who purchase their firewood from local dealers are also doing their part to finance their communities, sustain jobs and secure their nation's energy independence. It has previously been demonstrated that local purchasing – whether food, hardware, or firewood – makes a lot of fiscal sense. The more local shoppers purchase goods and services from small community vendors instead of large chains, the more self-reliant and resilient the economies of these areas become, experts say. According to a study by the independent British think tank New Economics Foundation, twice the money stayed in the community when consumers bought goods from a local market rather than a chain store. Such evidence echoes what local purchasing advocates have been saying for some time. "If you're buying local and not at a chain or branch store, chances are that store is not making a huge profit," says David Morris, Vice President of the Institute for Local Self-Reliance, a nonprofit economic research and development organization based in Minneapolis and Washington, D.C. "That means more goes into input costs—supplies and upkeep, printing, advertising, paying employees—which puts that money right back in the community." Moreover, buying local helps keep money circulating in the community by increases the “velocity of money” – the term economists use to describe the rate at which the currency changes hands. Most experts tend to agree that the greater the velocity of money in an area, the better it will be for the local economy. As David Boyle, researcher for the New Economics Foundation explains, “Money is like blood. It needs to keep moving around to keep the economy going." So whether you’re in the market for food or fuel, it really is better to buy local. By purchasing firewood from your local dealer, you can be assured you are doing your part to help your neighbors and, if you are American, wean the U.S. off of expensive foreign oil. In recent years there has been considerable attention given to European boilers and boiler testing methods, but much less given to European stoves. European national governments are aggressively incentivizing wood heat in addition to regulating it, unlike the US where needed regulation is not combined with promotion of the cleanest forms of wood heat as a renewable energy source. Although I am no expert in the European wood and pellet stove market, I spent a month in France and Spain this summer and was very impressed with what I saw. The wood stove market is much larger in Europe than it is in the US. Apparently, more than 2 million stoves and inserts are sold every year in the 27 European Union Countries, and there are 42 million installations. (On average, in the US there are less than 250,000 stoves and inserts sold every year and only about 13 million installations.) Additionally, about 450,000 wood cook stoves are purchased each year in Europe, and there are 7,500,000 installations. The population of the 27 European Union countries is about 500,000,000 whereas the US is about 300,000,000, so it’s a bigger market but probably even more urbanized. In France, 30 – 40% of the population in most areas uses wood as a primary or secondary heat source. However, there was not the explosion of low efficiency polluting devices that occurred in the US in the 1970s and 1980s. 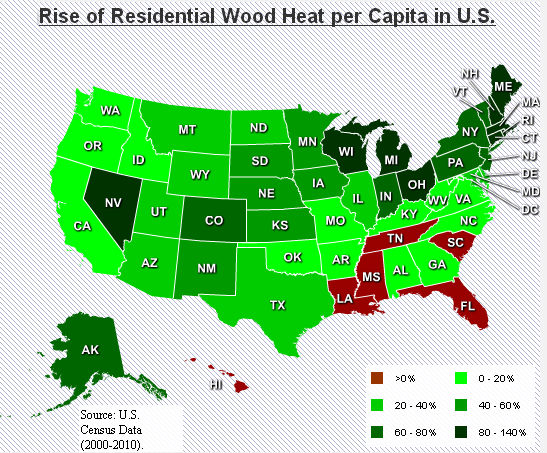 As a result, the average French person does not regard wood heating as a pollution problem as many Americans are likely to. France has had tax credits for stoves at 15% starting since at least 2001. In 2005, they rose to 40% and were as much as 50% in 2008 and 2009. In 2010 they went down to 40%, and in 2011 they were further reduced to 36%. Due to budget cuts, tax credits are likely to be reduced again in 2012 or end altogether. To qualify for the credits, stoves had to be 70% efficient and under 0.3% CO emissions, which conforms to the French eco-label Flamme Verte’s standard. Unlike the US, where the 30% tax credit in 2009 and 2010 applied to virtually every certified wood stove on the market, the French have used the tax credit to incentivize manufacturers to build cleaner products and for consumers to buy them. However, Flamme Verte’s is not a particularly strict standard. It allows higher emissions than most or all other European eco-labels, particularly in Germany where standards are getting progressively stricter. Most stoves on market in France are 71 – 77% efficiency (LHV), whereas pellet stoves are at least 10 points higher. Maximum emission and efficiency standards set by the European EN standards are not particularly strict, which has opened the door to many eco-labels, such as Blue Angel, Nordic Swan, Flamme Verte, DINplus, etc. Usually, government incentives are tied to standards set by the eco-labels. Similarly, an NSPS that sets 70% efficiency threshold and a 4.5 gram an hour emission limit for both wood and pellet stoves leaves much room for stricter standards by either Energy Star or a private label. European manufacturers say eco-labels have been a driver of sales, whereas in the US the stove industry association appears neutral or wary of such a label. Incentives in Europe have also helped to move consumers from fireplaces to stoves and from wood to pellets, a policy tool that has yet to be used in the US except very locally, in changeout programs. 1. Wood and pellet stoves and boilers are increasingly being tied into other renewable systems. Solar thermal systems and wood and pellet stoves can be integrated – not just with boilers. Stoves and air source heat pumps are also combined to use the same ducting, which provides AC in the summer. 2. Many brands heat water for both domestic hot water use and for space heating. In addition to many French manufacturers, UK’s Hamlet – which makes small stoves – and Spain’s Bronpi offer hot water options. Why isn’t such a stove on the market in the US? 3. Some major brands, such as French manufacturers Supra and Fondis, have heat exchangers and ducts to other rooms in addition to fans that push hot hair through the ducts to heat adjacent rooms or other floors. 4. There are some units on the market that use electronically controlled air adjustments to reduce emissions. These are called electric “Advanced control loops” (draft control according to temperature and flow rate of flue gases). 5. Unlike their reputation in the US for being small, many European brands offer fireboxes that can take pieces of wood between 20 and 28 inches long. On the other end of the spectrum, British stove maker Hamlet makes many stoves that take pieces of wood as small as 7 – 10 inches, making them ideal for small rooms and boats. 6. Many brands offer cook stoves that are just as efficient and low emission as stoves that achieve relevant eco-label standards. 7. In England they have developed a sophisticated system of only allowing certain types of stoves and fuels in high pollution areas such as London. The “smoke control zones” set out by DEFRA require that all stoves be approved for use. This mainly restricts fuels to pellets and manufactured logs; however, it does allow wood in some very low emission equipment, including in a select few American made stoves. For more information: www.uksmokecontrolareas.co.uk. 8. Some brands use catalysts that are electrically preheated to effectively reduce particulates even during the first 5 – 10 minute start-up period. The European equivalent of the HPBA Expo is in France from March 22 – 25, 2012 and promises to showcase many technological advances. More of us from the US should be there: http://www.boisenergie.com/sommaire-en.php3. Last month, we posted a story which also ran in our newsletter about attempts in Rhode Island to pass legislation on outdoor wood boilers. We received several interesting communications as a result and wanted to update that story - and correct ourselves. One of the communications was from Central Boiler, who gave us permission to quote from their email. They rightly pointed out that we failed "to make mention of the most recent Rhode Island Department of Environmental Management’s Regulation No. 48 which became law April 14, 2011." That regulation requires that all outdoor boilers installed after July 1 are Phase 2 qualified and Central Boiler was not opposed to this regulation. Central Boiler also noted that the Alliance for Green Heat mistakenly indicated that Pennsylvania has established a 150 foot set back, whereas in fact it is 50. We stand corrected. Also, Central Boiler said that they had "NOT taken out any ads regarding the Bills" in Rhode Island, as the Alliance had alleged. However, the Alliance has in its possession a paid advertisement on page 11 of the March 30 edition of the Rhode Island “Bargain Buyer” signed by Central Boiler and apparently taken out by a Central Boiler dealer or agent. 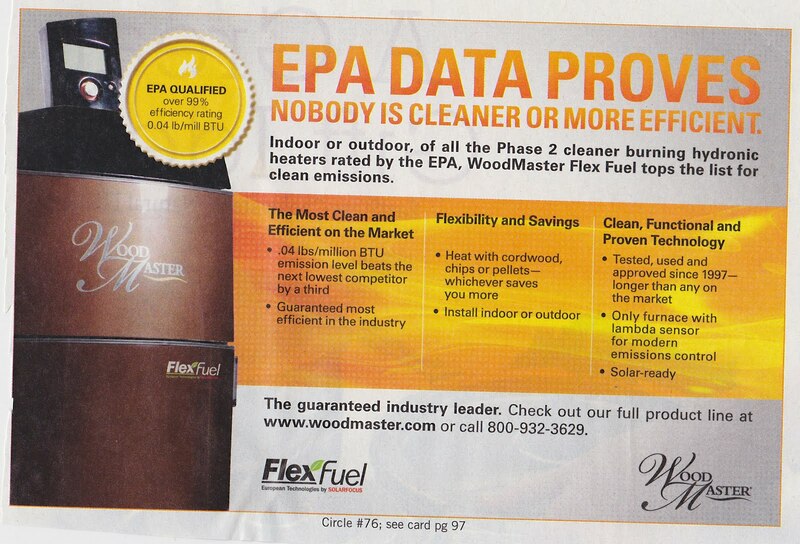 The ad urges owners of outdoor wood boilers to contact their legislator to oppose H5783. 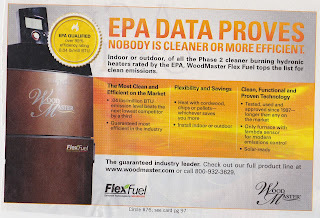 The Alliance for Green Heat believes that the EPA should have established a mandatory program for outdoor wood boilers years ago, requiring that only Phase 2 boilers be installed anywhere in the country. We also support the provision in H5783 that would have required that non Phase 2 boilers be removed upon the sale or rental of a home and that outdoor boilers be set back 150 feet from the property line. While the Alliance for Green Heat and Central Boiler do not agree on many things, we appreciate the open and respectful dialogue we have with them. This last Tuesday, Washington DC witnessed a rare event; a group of policy makers, industry officials and environmental organizations gathered to discuss the renewable energy contributions of everyday Americans using wood to heat their homes. The basics of this technology has been around for hundreds of years, but its modern form has yet to earn the same respect and attention flashier renewable energies such as wind or solar power receive. Wood heat provides 80% of residential renewable energy in America, solar PV 15% and geothermal only 5%, but wood heat has consistently been neglected by state and federal policy makers. On Tuesday, the Alliance for Green Heat’s Symposium, “Scaling up Residential Biomass Heating” helped to raise the profile of residential wood heat in Washington. This symposium explored the opportunities for policy makers to maximize the potential of residential wood heat to reduce fossil fuel use in a tight fiscal climate, while minimizing its drawbacks. The eleven expert speakers covered the policy landscape, sustainability and emissions issues, state and federal case studies and results of a newly released study on wood heat incentives. The discussion was divided into two panels, the first, “Wood Heat in America: The People’s Renewable,” was a bright look at the scale and potential of wood heat in America, with Dave Atkins from the Forest Service outlining the ecological benefits of firewood harvest, John Ackerly of the Alliance for Green Heat presenting on how wood heat will continue to outplace solar, Jack Goldman of the Hearth Industry discussing how technological innovations are cleaning up wood smoke and Jon Strimling of American Biomass discussing how the country can further scale up wood heat. This panel was introduced by Edmund Gee of the USDA, and moderated by Lily Donge of the socially responsible investment group, Calvert Asset Management. The second panel outlined various policy and incentive options for residential wood heat. The Alliance for Green Heat’s Tatiana Butler both moderated and discussed their newly released 130 page policy toolkit on Transforming Wood Heat in America. Scott Nichols of Tarm USA began the discussion by comparing the US’s progress on promoting wood heat as a valuable energy solution with the great advancements Europe has made. Steve Nadel from the American Council for an Energy Efficient Economy discussed how incentives can act to drive the market towards the most efficient appliances. Finally Chris Rice from the Maryland Energy Administration gave a real life example of how Maryland has tried to integrate wood heat into their renewable energy policies. Ed Cesa concluded the symposium with a discussion of the valuable educational work the Wood Education and Resource Center performs and finances. Stakeholders who attended included representatives from the Forest Service, EPA, state energy offices, the EIA, environmental groups, non-profits, the Congressional Research Service and many wood heat related businesses. There was concern expressed over how we would know when the nation would hit the point of unsustainable harvest. While that point is far in the future, attendees felt it was important to consider when growing the use of woody biomass while other uses of it may grow quickly as well. Other discussion centered on how low-income families would be affected by tightening emission standards and the difficulties invasive species such as the Emerald Ash Bore, pose to the firewood industry. The Alliance for Green Heat wishes to express its thanks to everyone who participated and contributed to a valuable and ongoing discussion, and especially to the Wood Education and Resource Center, and the Forest Service headquarters. For copies of the power point presentations, click here.